A man accused of throwing acid at clubbers in a busy nightclub was previously convicted for an assault at another venue, a court has heard. 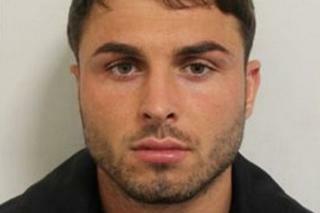 Arthur Collins, 25, was convicted of actual bodily harm in December 2015 for punching another clubber in the face, Wood Green Crown Court was told. He and Andre Phoenix, 21, are accused of injuring 16 people by throwing acid at the Mangle E8 nightclub in Dalston, east London, on April 17. Mr Collins, of Broxbourne, Hertfordshire, and Mr Phoenix, of Tottenham, face five counts of grievous bodily harm with intent and 11 counts of actual bodily harm. Prosecutor Luke Ponte told the jury both men repeatedly said "no comment" to police during interviews over the attack. He said Mr Collins, the ex-boyfriend of The Only Way Is Essex star Ferne McCann, had also initially told police "no comment" when he was questioned over the attack on 28 December 2015. "In a further interview, after Mr Collins had been identified, Mr Collins gave a prepared statement indicating it was a pre-emptive strike as the male was being aggressive," he said. The court has previously heard he does not deny throwing the substance but claims not to have known it was acid.